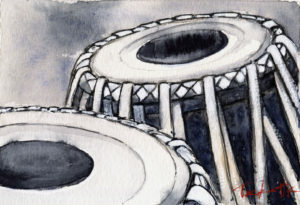 There are many theories and legends about the development and evolution of Tabla. The physical structure, the repertoire and the techniques of the instrument have many similarities with several other indian drums that coexisted, like: the Mridangam, an ancient south indian double ended drum, which is the most important drum in Carnatic music (south indian classical music) and the Pakawaj, an ancient double ended drum used in another genre of indian classical music, called Drupad. Moreover, folk instruments like Dhukar, a pair of drums played with the fingers, Naqqara, a pair of drums played usually with sticks and Dolak, double ended drum, have also many similarities with the Tabla. The most ancient evidences, for double handing drums that look like the Tabla, come from carvings in Hindu temples, like Muktesvara temple and Bhuranesvara temple of Badari in Bombay dating back to 500 BC. However, in the ancient indian texts for music the instrument is not mentioned at all and it is only in the mid 18th century that appear the first references to Tabla in indian texts and images. The legend says that Amir Kushrau, a legendary figure in the field of indian classical music, develop the Tabla in the 14th century by cutting a Pakawaj or Mridangam in the middle. Most probably the Tabla, as we know it today, is a comparatively recent development in northern Indian music. It combines characteristics from different indian drums that coexisted.The most important characteristic is the usage of the siyahi (also known as the gob) on both of the drums. A distinctive black dot in the middle of the skin of the drums, which is a compound made from iron powder, flour, and other ingredients. The siyahi is a very old indian concept, used in many indian drums, that attenuates the harmonic overtones of the drums, giving them their pitched quality which enabled sound modulation to a great extent. The name 'tabla', probably derived from the Arabic word for a drum (generic), called the 'tabl'; and possibly to some extent the Turkish word 'dawal'. During the 13th and 14th century the first Muslim invaders started ruling in the north India and as a result there was a rapid fusion of the Perso- Arabic, Turki- Iranian and Indian musical systems. Until the 18th century many of the sultans continued the Indian tradition of music patronage in north India and the outcome of that process was, Khyal, a new genre of Indian classical vocal music, where the Tabla was the main accompany instrument. Khyal has been the predominant concert vocal genre since the early 19th century, the times that Tabla got established, too, in the scene of indian classical music. It seems like the development of Tabla is parallel with the cultivation of Khyal. It was probably a need of the times, from 13th to 18th century while Khyal was growing, a new accompaning drum, more sophisticated, to fit for the accompaniment of the new vocal style. The first Khyal gharana was established in Gwalior, present state Madhya pradesh, in the early 17th century and the first Tabla gharana founded in Delhi, by a pakawaj player called Mia Siddhar Khan Dhadi, in the early 18th century.